RIO DE JANEIRO, BRAZIL – As the 2016 Olympics are under fifty days away, the latest in the series of revitalization projects in the city’s port zone opened this past Sunday, June 19th, with Rio Mayor Eduardo Paes inaugurating the Marcello Alencar tunnel. The new tunnel, named after one of Rio’s former mayors, is now the longest underground tunnel in Brazil at 3,370 meters. 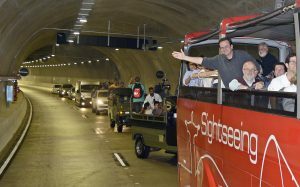 On Sunday, June 19th, Mayor Paes officially opened the Marcello Alencar tunnel, the longest underground tunnel in Brazil, photo courtesy of Prefeitura do Rio de Janeiro. The tunnel replaces the Elevado da Perimetral highway which ran along the Guanabara Bay waterfront as part of the Porto Maravilha works. The demolishing of the highway in November 2013 paved the way for not only the Marcello Alencar tunnel, but also new public squares, walkways, and bike paths, as well as the new light rail transit system, the VLT. 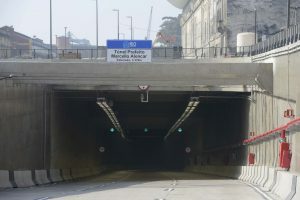 The tunnel connects with Via Expressa (Via Expressway) near Armazém 8 (Warehouse 8) at Avenida Rodrigues Alves on one end and stretches out to Avenida General Justo near Santos Dumont Airport on the other. The longest underground tunnel in the country, its deepest depth reaches 46 meters below sea level. The tunnel is also equipped with 105 security cameras. Government authorities expect the tunnel to provide an efficient way to travel from the Rio-Niterói bridge all the way to the Aterro do Flamengo. Each direction of the tunnel has three lanes and has the capacity to move 50,000 cars daily. With three lanes of traffic in each direction, the new tunnel has the capacity for 50,000 cars daily each way, photo courtesy of Prefeitura do Rio de Janeiro. According to government projections, the combination of the Alencar tunnel and the Via Expressa will relieve the flow of vehicles in the Santa Bárbara and Rebouças tunnels by an estimated 20 to 30 percent during peak rush hour morning and evening times. During that peak period, this would amount to a reduction of about eight hundred vehicles in the Santa Bárbara tunnel and about seven hundred in Rebouças. Mark Lassise, an American expatriate living in Rio for over seven years, shared, “I believe this project is going to help. I hope that the final product proves to have been made with sound engineering unlike the ciclovia along Avenida Neimeyer.” The coastal Tim Maia bike path (ciclovia) collapsed on April 21st, four months after opening, killing two and injured many others. In addition to marking the opening of the new tunnel, Sunday’s ceremony was also a chance to honor the tunnel’s namesake. Marcello Alencar served as Rio’s mayor for two separate terms, from 1983 to 1986 and 1989 to 1993. Alencar, who passed away in 2014, was also the governor of Rio de Janeiro state from 1995 to 1999. During the 2016 Olympics, Rio’s revitalized port zone will be home to several key attractions, including the Brazil hospitality house (Casa Brasil), the largest Olympic hospitality house, and the NBA House, a meeting place for basketball fans and players during the Games. Nelson is a native New Yorker now living in Rio de Janeiro. He writes about local politics, business, real estate, sports, and Brazilian beachwear. This is a wonderful improvement to Rio whose historic downtown area was disfigured by the concrete flyover which used to run all along the coastline. Its replacement by a tunnel and all the new buildings and pedestrian areas will turn this part of Rio into a destination for both turists and Rio residents. This was all done in a short period. Congratulations to the mayor and his team!